Those who send meeting requests for Webcast across the world often encounter with the problem of Time zones . Its difficult to understand whether the timing is appropriate or not for all participants to join. The timing that is convenient to you may be out of office hours for the participants. So you need a tool that should tell you what will be the time in their country against the proposed meeting time by you. At this juncture, It is prudent to understand how outlook handles time zones. When the requester mentions time for an appointment,It shows Time according to the time set for the requester's time. and in the background It converts it in to GMT. 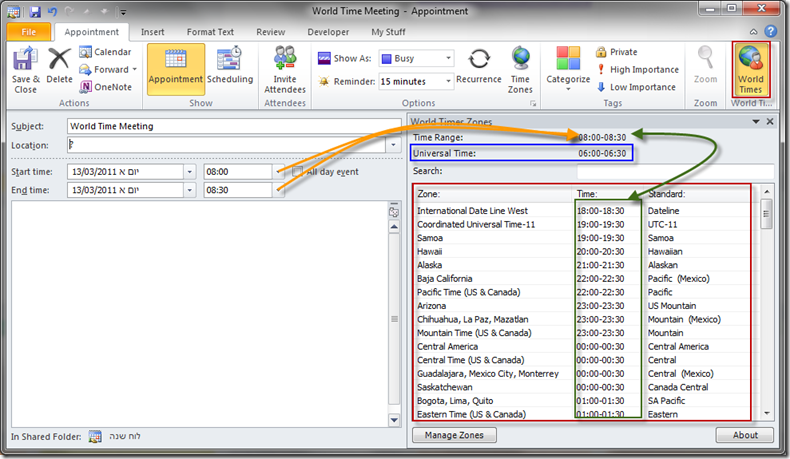 When it sends the appointment to attendee, it converts the time from GMT to the local time based on the time setting of the attendee's computer! In the process, it also considers daylight saving time adjustments also while transferring and showing the appointment on attendee's calender! 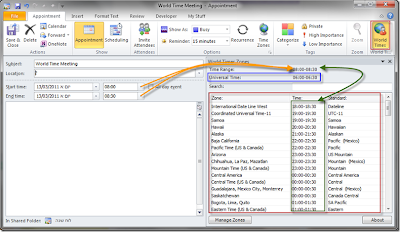 Understanding appropriateness of time across time zones while scheduling meetings and sending an invite on Outlook. The add in is brilliant piece of work by Shai Ratien, a Microsoft Most valuable Professional. I recommend it to all those who work with people across timezones.